Yesterday's posting in this Two Worlds blog featured a picture of the Larsen C Ice Shelf, and noted that one of the consequences of ACD (anthropogenic climate disruption) is the loss of ice in the Arctic and Antarctic. This huge change in the Natural World (the stability and constancy of which we have always assumed could be taken for granted) will have massive impacts on our own world, the world that human beings create. "Our" world is sometimes called "civilization." We tend to forget that our human civilization is ultimately and radically dependent on the World of Nature. Today's picture shows horrendous wildfires, out of control. This photograph was taken in the Cold Lake area of northern Alberta, Canada, which is where oil-sands production is feeding the runaway global warming that is resulting in the accelerating loss of fresh water reserves, bound in ice and snow, all over the planet. So, ACD means not only less ice. It means more fire, too. T.S. Eliot to the contrary, this is the way our World ends. Human assumptions of the stability and constancy of the Natural World have always been erroneous. The Natural World has always changed. Stability and constancy are unwarranted human expectations. The picture above depicts a forest fire, not a “horrendous wildfire, out of control.” Forest fires are a natural part of forest ecosystems. Forest fires are an essential part of the Natural World. Without fires, forests become unhealthy and decline. One of the reasons, the main reason, that many forest fires are large and consuming is because humans have attempted to control forest fires, thus producing less healthy, vigorous and resilient forests. The article cited is from The Wall Street Journal, an economic publication. 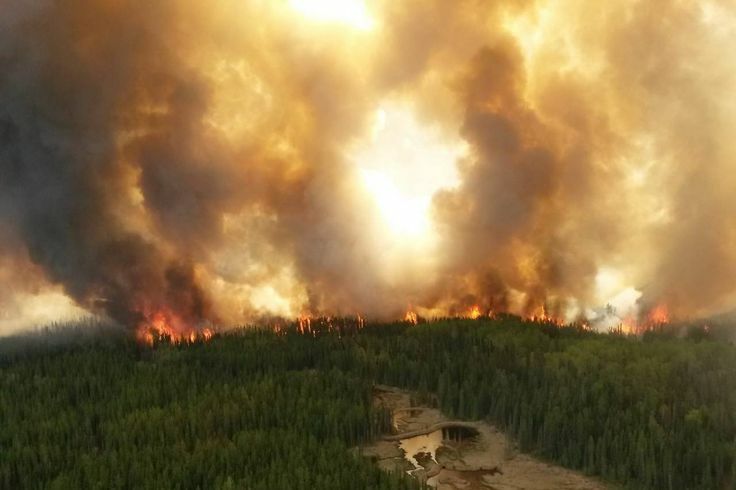 It decries the “horrendous wildfire, out of control,” because it is interfering with oil sands production, a human economic activity that is destructive of the Natural World. It’s difficult, and essential, to step outside our anthropocentric perspective when contemplating the Way of the Natural World.